I’m wrapping up this year’s Halloween costumes for the girls, so I thought I’d take a little trip down memory lane with past costumes. I think you will notice a trend I like to use for costumes. If I’m going to invest the time it takes to make something handmade, I want it to get more use than on one special day. I tend to make one basic piece then create the costume effect through accessories. Last year’s daisy costume is the perfect example. 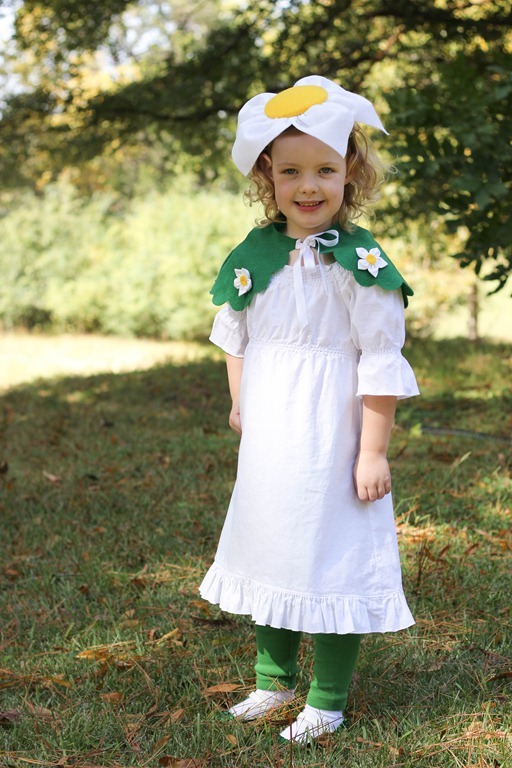 I sewed a basic white dress and accessorized with a cape, headband, and glitter shoes. I even have a tutorial for the daisy headband. You’ll find the cape from another costume below. The year before, Avery was Fancy Nancy. Again, I sewed a ruffled purple dress that could be worn many times over. The shoes, necklace, wings, and crown just pulled the look together. This fun garden gnome skirt was worn throughout the fall sans cape, hat, and shoe covers. Avery’s first handmade costume was basically an embellished tutu for a cupcake fairy. This tutu was pulled in and out of the dress up box up until last year! So, if you don’t want to tackle a costume for one use, brainstorm how you can create lasting basic pieces and fill in with the accessories.